Geneva, Switzerland, 31 May 2018 – As the 2018 edition of the European Business Aviation Convention & Exhibition (EBACE) concluded its third and final day today, organizers reported that by every measure, the event once again served as a powerful and forward-looking showcase for the European business aviation industry. EBACE is jointly organized each year by the European Business Aviation Association (EBAA) and National Business Aviation Association (NBAA). The EBACE week began with a pre-show Media Luncheon highlighting a new industry initiative to advance the development and adoption of Sustainable Alternative Jet Fuel (SAJF), and introduction of the “Business Aviation Guide to the Use of Sustainable Alternative Fuel (SAJF),” focused on raising awareness and adoption of available and sustainable alternative jet-fuel options. 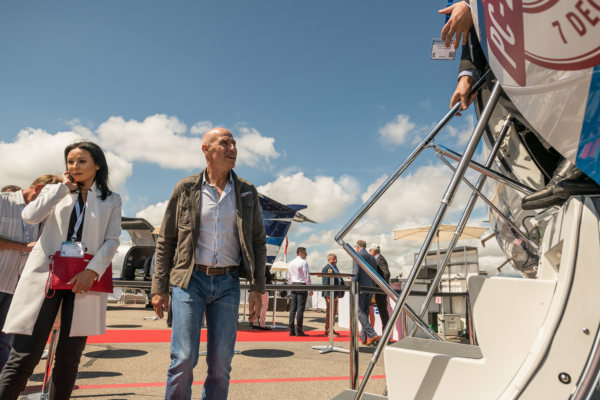 EBACE2018 began its opening day with a standing-room-only session featuring an awe-inspiring keynote presentation by Yves “Jetman” Rossy. An accomplished military and commercial pilot, Rossy is also the inventor of a series of experimental individual jet packs that have given him the ability to soar like a bird over the English Channel and U.S. Grand Canyon, and even fly in formation with an Airbus A380. A packed exhibit floor featured 418 exhibitors, an increase over last year’s event, from across the world. EBACE2018 also welcomed a number of first-time exhibitors to the show, while a host of companies chose EBACE as the ideal venue to announce new aircraft, products and services, with press conferences and media events throughout the week. Attendees at the show represented about 100 countries. The sold-out EBACE2018 static display featured 54 aircraft on the ramp at Geneva Airport, ranging from intercontinental business jets, to turboprop and piston aircraft, to helicopters. The event also hosted introductions of new aircraft making their first appearances at EBACE2018. Another prominent initiative on display throughout EBACE2018 was EBAA’s recently-unveiled Expanding Horizons program, a continent-wide awareness campaign to highlight the value of business aviation in the European region. The week included the release of the EBAA study “Expanding Horizons: How Millennials see the Future of Business Aviation,” which revealed that young professionals recognize the main benefit of the business aviation industry to be its ability to take people where they need, when they need. Returning to EBACE2018 was the event’s second-annual Careers in Business Aviation Day, which introduced more than 250 students from high schools and universities across Europe to the broad range of potential career paths throughout the industry. Also a part of EBACE2018 were the EBAA Awards of Merit, recognizing companies that have established a solid safety culture within their organizations. This year, EBAA recognized five European companies for achieving 100,000 accident-free flying hours. The award presentation kicked off a series of sessions focused on the latest insights for continually enhancing business aviation safety, a top industry priority. In addition, the event hosted the well-attended International Aircraft Transactions Seminar, a day-long presentation addressing common questions and concerns with the purchase, importation and operation of business aircraft throughout Europe. EBACE2018 also featured numerous informative education sessions addressing top concerns in the European business aviation community, including the implications of Brexit for business aviation, improving access to European airspace and airports for business aviation operators, promoting career opportunities within the industry and the role of business aviation in times of crisis. During the event, organizers took a moment to recognize the life and legacy of Serge Dassault, who passed away on 28 May at age 93. EBACE2018 was dedicated to Dassault, who in 2009 received NBAA’s Meritorious Service to Aviation Award for his contributions to business aviation. Review news stories, photos and more in the EBACE2018 online newsroom. Next year’s EBACE will return to Palexpo and Geneva Airport from 21-23 May 2019.